So far, nearly all the items I've blogged about making have been successful, and I would recommend you try those specific patterns if you're interested in making similar things. However, I don't want you to think when reading my blog that I'm just saying nice things so that everyone likes me. I thought I could counter this by sharing a few fails, but, other than projects that are hibernating because I got bored of them or needed to do something else more urgently, I don't actually have all that many full on fails, and for those that didn't work out as well as I hoped, the pattern isn't usually to blame. Instead I thought I'd share my process on picking a pattern and how I try to avoid fails as early on in the process as possible. I find almost all the patterns I use on Ravelry. I have two major processes for starting projects - either I want to give someone a specific thing, or I have some nice yarn and want to find something to make to show it off. I have two main principles for picking patterns - find something that's well written, and find something that works for me. Pictured above is something that could have been a fail - the spiral baby blanket I made for my youngest niece when she was born. The middle of this blanket was really difficult to do and I don't think I ever really got it right, but I got it working well enough that I could continue to make the rest of the blanket. My niece is two and a half now, and I'm a more experienced crocheter. I would still say this pattern is worth trying if you're a little more experienced, because the tricky bit is right at the beginning, so you can frog and do something else without losing a lot of work, and the finished object got a lot of compliments and is still in use albeit as a throw as my niece has grown out of it. I could have avoided the angst if I wanted though - other people had made this project and also had problems getting started. 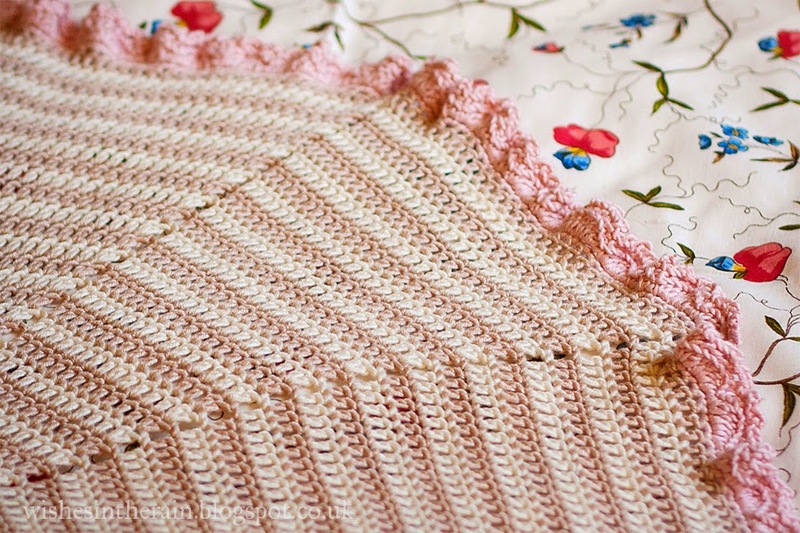 There are many projects for it on Ravelry, and several of them have described their difficulties. I knew what I was getting into, to an extent. Photos, their quality and number - do you have pictures of the back? of all sides? if the designer hasn't posted any, there may be some in the projects. They don't have to be super artistic, just clearly showing what the finished project should look like. Projects and comments - have other people made this? Are their results good? For example, if I wanted to make a circular blanket, I would avoid one that no one had been able to get flat (if they're using the hook/yarn weight combo recommended). If no one else's project looks good, the chances are mine wouldn't either. Reputation - if there's a new pattern you'd like to try, and especially if it's one you'd have to pay for, has the author published other patterns that people have liked? If they have then it's worth taking the risk. If someone's charging $5 for a pattern for which they've provided one small photo and no one else has made it, I'm not going to be the first. But if there are several pictures by the artist, showing the pattern in different yarns, I'm happy to take the risk. The classic baby blanket was my real fail, but that wasn't the pattern's fault, it was all mine. The pattern calls for worsted weight yarn. I would have liked to use wool, but the daughter of the person I made it for is allergic, so I thought it was likely her new baby may be allergic too. I didn't want to use acrylic, and the pattern recommends cotton, but I couldn't easily get an appropriate cotton worsted at the time so I used double knitting weight instead. I used a smaller hook to make up for it but not small enough, and the dk I wound up using was bamboo cotton and was on the light side of dk. My first struggle was getting an appropriate tension on my beginning chain - using the same size hook as for the rest of the body left it much too tight. 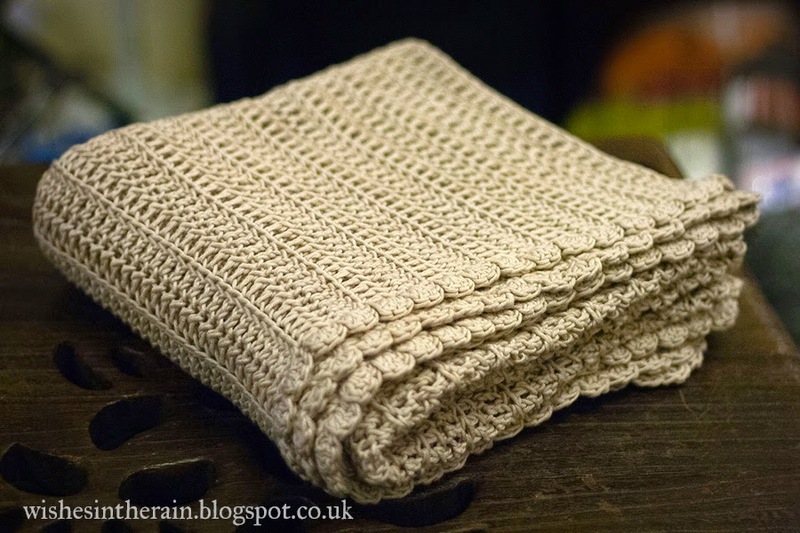 After I thought I fixed that, I carried on crocheting and got a long way on the blanket, only to find that it was no longer rectangular - it had gradually got wider despite my best efforts. Finally, wet-blocking it made the rib texture completely fall out. It was lovely and drape-y because of the bamboo in the yarn, but it wasn't remotely how I had pictured it from the pattern. Because it was cotton/bamboo, I wasn't even able to block it to be properly rectangular, as you can tell from the picture above - the edges were as even as I could make them, but not all that even. Happily, the person I made it for, not having preconceived notions of what it should have looked like, was very happy with it, and she was very appreciative of the time and care I had put into making something for her, regardless of the outcome. And I learned a lot from it too. For example I learned that I find making blankets in that style stressful, and I'd rather make granny squares or circular blankets, because the errors tend to get distributed more evenly and the final results are better. Look for patterns that suit my style. 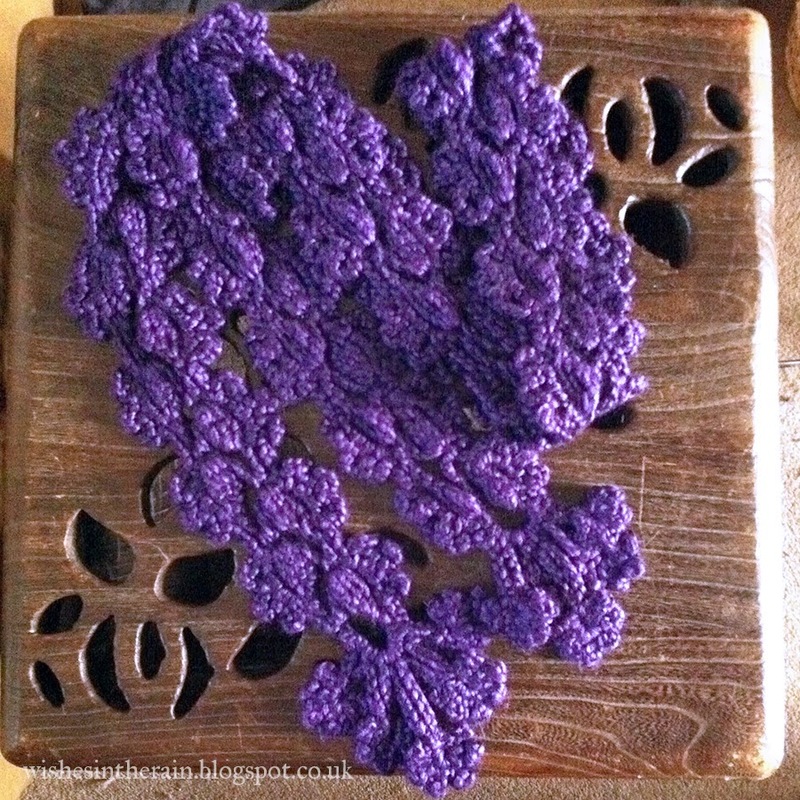 I enjoy things that don't require a lot of counting or loads of concentration, because I like to crochet in front of the tv and I find counting stressful. I also find sewing lots of pieces together in amigurumi stressful too. Your style may be different, and it's always worth trying new things, but I can look at some patterns and say, no, that's not for me. Have examples similar to what I'd like to do. I went wrong on the classic baby blanket because I used the wrong hook/yarn weight combo. I should have looked more carefully at what other people were doing, and thought more carefully about how the characteristics of the yarn I chose would work with the pattern. Looking through other people's projects is a great way of finding combinations that work well, and things to avoid. Not be afraid to change things. If a pattern starts with a huge number of chains and then a plain row of dcs, for example, I switch out for a foundation dc row. Or if it says make 6 sts into the second chain, I will substitute a magic ring. I prefer both of those techniques, and in most cases it won't make a difference to the finished item. It's good to give a tough pattern a chance, but it's important to know when something is proving to be more trouble than it's worth. It may be you, it may be the pattern, but time is limited and there's no point wasting it if you hate what you're doing. For example, the first time I tried the flowering clematis scarf, I used really pretty Noro yarn (silk garden I think) that just didn't work for me with the pattern, and I thought it looked horrible. Rather than finish I frogged it and tried again with a much more appropriate yarn. If you make something and it works out well, or if you make something and it doesn't work out but you know why, share. Blog it, make a project on Ravelry - you'll be helping the next person who comes along. Plus it's always nice to have a little show-off from time to time!